It's hard to resist a warming chicken and ham pie with a side of crunchy coleslaw. Put the chicken, stock, cream or milk, celery, leeks, potatoes, garlic and ham into a large saucepan. Bring to the boil, reduce the heat, cover and simmer for about 20-25 minutes or until the chicken is tender. Pour the pan contents into a colander set over a large heatproof measuring jug. You will need 250ml/9fl oz of liquid. Make up the quantity using extra cream or milk, if required. Allow to cool slightly while you make the roux. Clean and dry the pan, add the butter and melt gently over a moderate heat. Stir in the flour until thoroughly combined, and cook for a few minutes but do not let the mixture colour. Stir in the poaching liquid, about a third at a time, heating and stirring well between additions, until the mixture is thick, smooth and velvety. Stir in the nutmeg and parsley, then add salt and pepper, to taste. Stir in the cooked chicken and vegetables and toss gently in the sauce until well coated. Cool for at least 10 minutes, ideally cool completely and chill in the fridge. Unroll the pastry onto a floured work surface. Turn a 14x18cm/5½x7in rectangular pie dish with a flat lip edge upside-down on the pastry sheet and cut around it, leaving a 3cm/1¼in border. Cut 2cm/1in wide strip of pastry to fit around the edge of the dish. Brush the flat lip edge of the pie dish with water and stick the strip on top. Ladle the filling into the dish, piling it up high in the centre. Set the pastry lid on top and press onto the pastry strip to seal. If there is any excess, trim it off evenly. Cut a 1cm/½in vent in the centre, then brush the egg and milk glaze over the pastry. Mark decorative patterns in the pastry, if preferred, or leave plain. Bake for 25-30 minutes, or until the pastry has puffed and is golden brown. For the coleslaw, grate the cabbage, carrot, beetroot, onion and radishes into a large mixing bowl. Add the mayonnaise, lemon juice, salt and pepper and chillies and stir well. Set aside in the fridge until ready to serve. 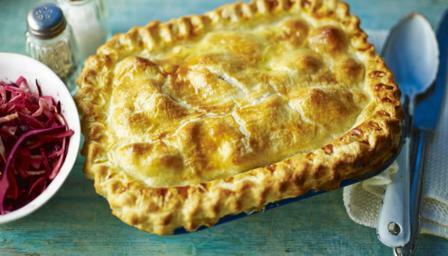 Serve the chicken pie hot, straight from the dish, with cold crunchy coleslaw alongside.